Asparagus is a delicious vegetable that can be included in meals in a number of ways— roast it, sauté it, grill it. Add asparagus to pasta salads or green leafy salads, add it to Italian stir-frys, and more. 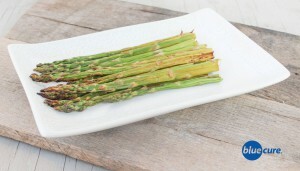 These perfectly roasted aspargus have a lemony zing and peppery taste– perfect for spring and summer, or for brightening-up a cool winter day. Preheat oven to 375 F. Wash and trim the ends of asparagus and lay on a pan. Cover evenly with olive oil, lemon juice, garlic and pepper. Cook for 5 minutes. Then turn over and cook for an additional 5 minutes or until lightly golden.